This guide was written on a timeline fashion so that your story can go parallel with the content of this page. Ice sheet has no growing season, forget about plants. Livestock is limited, you will be hunting anything you can eat regardless of it's taste. Pause the game immediately and check the size of the ancient shrine, the bigger it is, the more cryptosleep caskets it "may" be hosting. 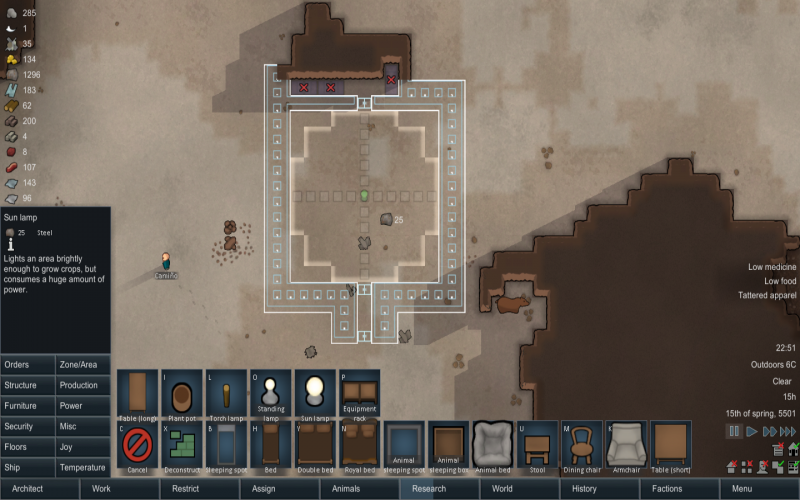 Pick an ancient ruin big enough to host your 5 characters leaving enough space for a butcher table and a research bench, plus a campfire. Nothing else for the first quarter of the year. You should be able to finish electricity research in 2 seasons more or less (30 ~ 40 days). From the second quarter, you can build tables and chairs. Analyze your team, set their priorities. 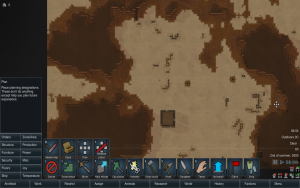 Haul everything towards your chosen ruin and don't use wood at all except for the campfire. Start mining steel as your main construction material or begin caving in. Play as minimalistic as possible. All you have to do at first is just research electricity. You don't need to build a fortress yet. Set an animal zone away from your food, you don't want them eating your food as you can't win the game with pets alone. Let them all die of starvation, sorry. 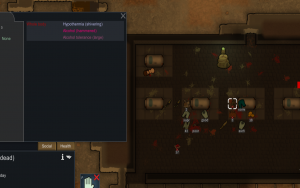 Starving pets are excellent lures for predators and while wild animals attack your pets, they won't turn their hunger rage towards you and you can attack them without danger, so long as their target is mid to big size (terriers die in a bear hit or two). Gather enough steel to build walls and several deadfall traps by setting everyone to mine. 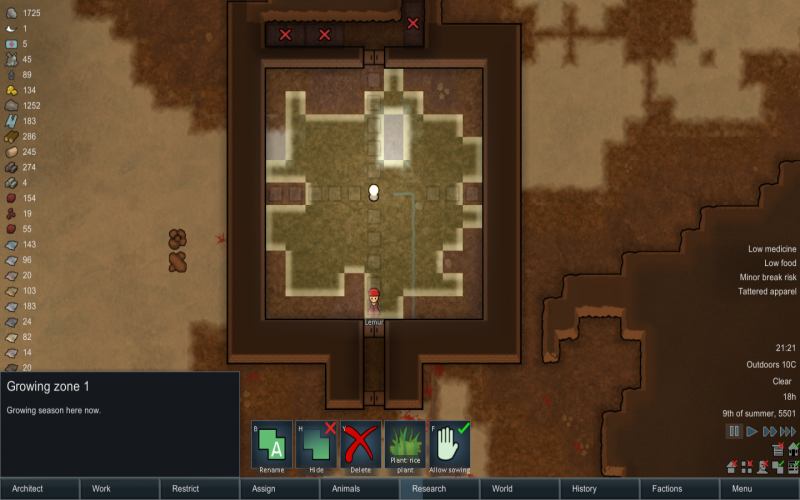 Use terrain features to get the smallest home you can make besides the initial ancient ruin rebuilding that is. Hunt every time you see meat, as animals have the tendency to leave the map and won't remain roaming around long. When you find one snow hare, you find the others. Double click on zoomed out view to reduce time spent on searching. Always keep an eye on the polar beer food bar. After you are done enclosing your ancient ruin and had built both benches. Your next job is to use the steam geyser as main home due to it's heat source. Living on top of a geyser provides warmth enough to 10 degree Celsius, just to escape hypothermia. 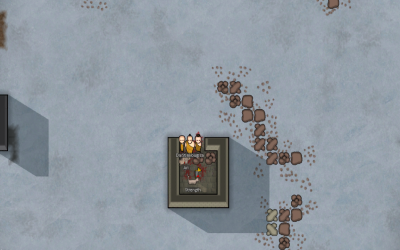 If your colonists complain about "sleeping in the cold", you tell them to man-up. The only two reasons to build a campfire are: to cook and an emergency extra source of heat when hard snow hits during Winter or a cold snap. 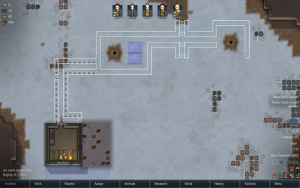 Build a wall around (10x10 , the geothermal power plant is 6x6 so between the wall and the steam, the 8x8 line will become a one tile surrounding corridor just enough to place beds around), either by emulating a heater in the center of your room or by pulling a one tile corridor towards your home, even possibly digging a tunnel depending on the terrain altitude map of choice. 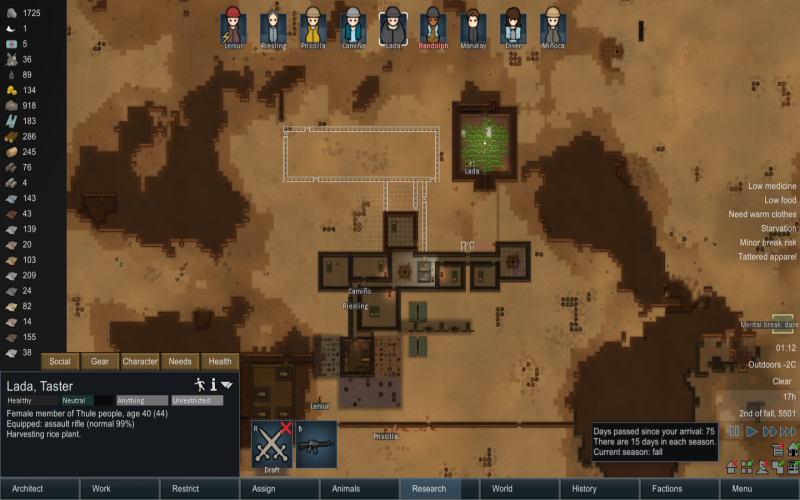 Eventually, you should ideally repeat the same geyser-room procedure with other steams in proximity, this is because cold and starvation will not kill you, but mental breaks will. For example, having more than two characters on berserk. Sometimes, two geysers may be close to each other, allowing you to use them at both ends while you build everything else in between. This lucky situation can allow to start building individual rooms for your people and get rid of the barrack penalties. 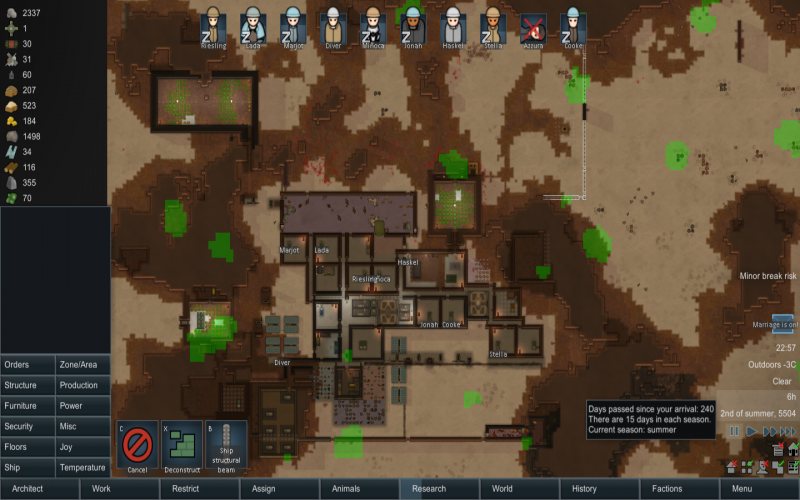 You will survive in this biome, by sending all to cryptosleep except for the researchers. 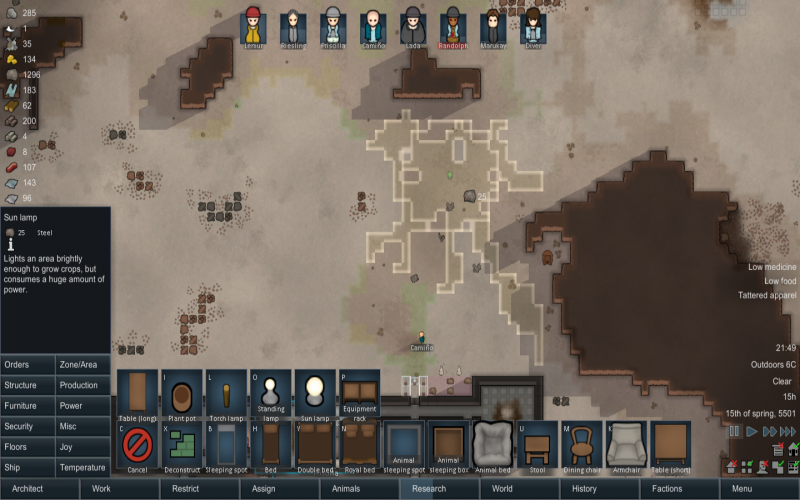 Be very careful here as occupants cannot eject by themselves and sending them all together won't let you continue playing unless a wanderer joins. You MUST keep an "active" hauler outside to open and free the others. Hives can become a valuable source of food, megascarabs are not guardians and unless megaspiders or spelopedes spawn; they won't last long. Do open all hidden areas, as they may spawn hives. Contrary to other biomes, do not kill their guardians as without maintenance you will lose your flow of free jellies. Just go pick them up while the guardians are asleep. And of course let them multiply hives. 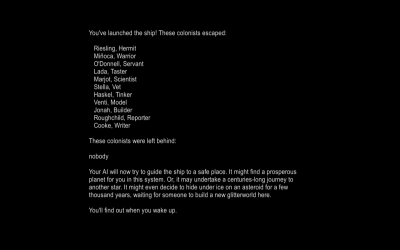 There's really no need to murder your crew to reduce your roster numbers, instead, open the ancient structure. Let go of those who don't want to join if your original characters are too wounded by the time you are at this. Attempt capture if conditions are good. And also strip the downed as they may have pemmican, gold, components and/plasteel. How many characters you should have depends on many variants. A suggestion would be the total number of available cryptosleep caskets + 3. 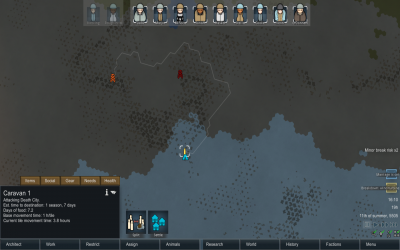 Between those three, two of them must be researchers and the other one extra a pawn that can serve the researchers by hunting, butchering and cooking for them. Then in any remaining time he/she would remain idle, join the researchers. Which means building additional two benches. Those that you choose to have them "awake" must have the capacity to HAUL. Or you won't ever be able to bring back those who you sent to cryptosleep. There will always be variables that won't let any player fix a number of "active" characters at a time. If food is low, you can continue with just both researchers. Less than two, you won't finish electricity research in time. You can also bring everybody else back to activity when circumstances require more people, such as raids. Because of emergencies, it's best if you can send them to cryptosleep with their bellies full and in good mood. You don't want to have them back active with hunger and metal breaks when you need them as back-ups. 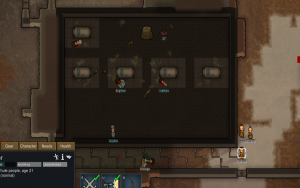 You can also store prisoners from pirate bands whose recruitment chance is over 95% as it may take too long and you don't want to waste food on them, and try to convince them only after you start to grow crops. 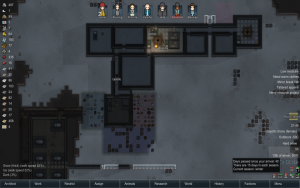 Wanderers welcomed, escape pods welcomed and refugees welcomed. Immediately after opening all the cryptosleep caskets, pause the game and run a full check on each surviving occupants. This is particularly important for those who play with the first five random characters given, without randomizing to cheesy convenience. Check the spacers and see who could become a valuable member of your main team based on what you originally lack. The rest will become food, but don't forget to strip them first so that you can use their clothes too. Otherwise, the "used by corpse" penalty will punish the wearer. The number of cryptosleep caskets + 3 formula is very convenient because you may likely suffer some casualties along the way (heart attack, berserker killed by another member, etc. ), just be careful not to lose the researchers. If you happen to have the "actives" in too much bad moods, consider switching formation with those in cryptosleep, so as to not lose the pace. Your wood storage shall be your countdown timer. You won't survive the game if you can't get electricity before you run out of wood. It's inevitable. Just be very selective when butchering other humans as the character performing the action will receive mood penalties that can easily set it to mental breaks. It is okay if your characters complain of hunger. Again, keep your food supply on check and only feed your people when starvation kicks in, unless of course, their mental break is too dangerous to risk keeping them unhappy. When butchering human corpses it's best to set one same character to chomp many at once so that all the penalty goes to just that one rather everybody, and performing the action on same day will keep the penalty length shorter than extended after each consecutive day. Best the penalty wears off all together at once. Your best cannibal chef will be either of the two pair who just got married and is in honeymoon phase. After electricity, go for Batteries, Solar panels and then Stonecutting so that you can start building plantation-rooms. Sun lamps consume large amounts of electricity and you should by then have enough power and stored energy so that your crops grown steady. Solar generators will not perform to their maximum capacity due to the short solar cycles common in polar regions as oppose to equatorian regions. After you have researched Electricity, Batteries, Solar Panels and Stonecutting AND crafted lots of stone blocks is when you can start building your first plantation room. Since the biome has scarce fertile tiles, you can easily select to mark a Grow zone and just drag your cursor on a 50x50 tiles area so that the game automatically marks where there is a "large" concentration of farmable area. Then just select the Sun lamp so that you can have the radius on your cursor ready to match such area. If you happen to lack said farmable tiles anywhere close to your base, you can fill in the blanks with hydroponic basins later on. Then use "Delete zones" to remove all growing zones that were created during the scan for farmable tiles, and use the "order" to "plan" to draw a cross of 11 tiles with tile number six (the crossing), being the location where the Sun lamp will be located. This will give you the radius of the lamp so that you can start setting the structure plans. Do use double walls for better insulation and with an airlock system as well. Once everything within the plantation room has been built, click the sun lamp and press "H" for the sun lamp itself to create a growing zone for you (instead of the conventional manual way). 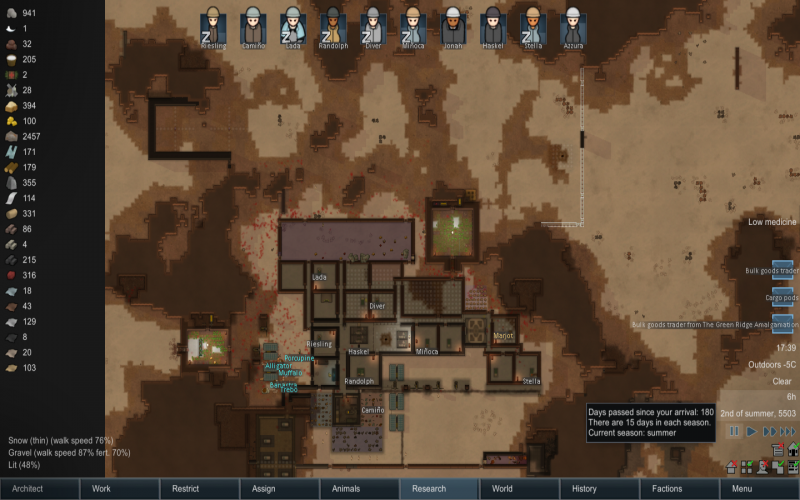 Start with rice, and harvest enough so that you can bring everybody else who has been in cryptosleep all this time for your colony to start running in full strength. Remind yourself that once temperature starts to drop again in Winter, you will need to install several heaters or plants will die. In the meantime, there's no need to rush directly your research towards hydroponics. You can go through Complex clothing, Drug production, Penoxycyline and then Hydroponics. Of course each player will play different stories, so adjust to circumstances as needed. In this demonstration, the first harvest takes place 75 days after start. Now you have both shelter and food. From here on, it's all up to you. Good luck! Maximum capacity still restricted upon food limitations. Keeping some members on crypto sleep unless a party is announced, the mood bonus is cumulative. There has been no cannibalism since then but nonetheless keeping the extra meat. 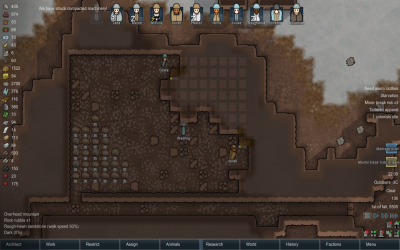 Solar flare can kill your crops so you still need to have wood stored to instantly build campfires to keep plantation rooms above -10 Celsius. Wild animal presence is rare compared to the beginning, even if leaving snow hares alive and feral, their predators hardly show up. Technological progress was crippled after losing a researcher, another one was recruited with 99% chance after a long convincing period. Wardrobe restriction of jackets, those who go hunting or mining will suffer hypothermia. Turtle march, slow but steady. 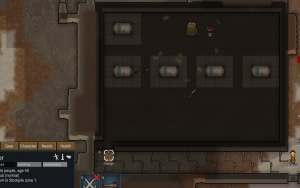 While there is no need to build a large freezer, it is still necessary for summer and also because visitors with animals will eat your food (instead of theirs) if not stored in a closed area. Food no longer an issue with cultivation switch from rice to potato. 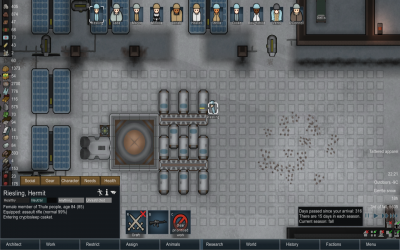 Loss of a cooker resolved by building a nutrient paste dispenser. By now, already extracting minerals for the spaceship with the ground-penetrating scanner. If you have a lot of Silver, request Exotic goods traders every four days with the comms console. 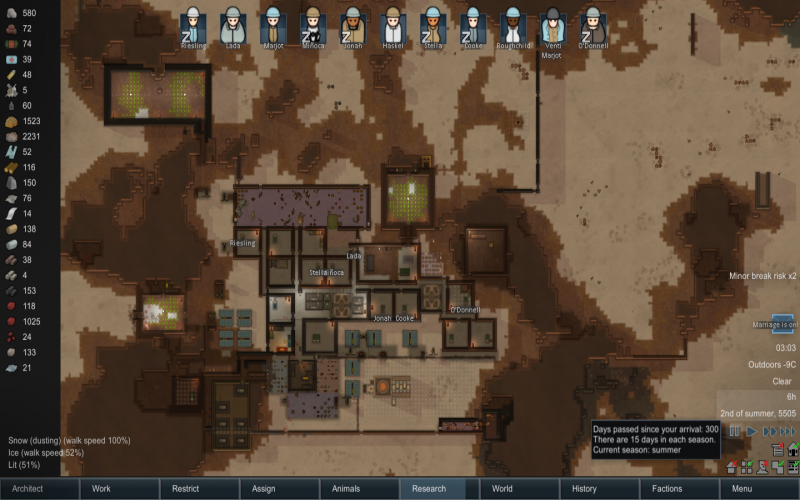 If you don't have money you can settle Component exclusive outposts within the periphery of your main colony by changing your game Options and increasing the maximum number of colonies up to five. Viable only if within reasonable reach. Transport pods can make it possible but too much work for little benefit. If the desire is high, multiple settlements will be needed. This page was last edited on 2 February 2019, at 11:36.